The Jeep CJ7: Innovative and Safer! The Jeep CJ7: Stout...Yet Refined and Safer! Enter the Jeep CJ7...The answer to "what do you get when you blend a CJ5 with a CJ6 while adding more safety and user friendly functions?" American Motors Corporation (AMC) was desperately trying to revive the aging CJ line of Jeeps after purchasing Jeep from the Kaiser Company in 1970. Then around 1973 all in the auto industry who produced and distributed larger and/or more thirsty vehicles took a huge hit from the Arab oil embargo and the media frenzied gas crisis that resulted. Big car and truck sales plummeted as people panicked from having to wait in long lines for gasoline...with gas rationing on top of all that. Many people scrambled to find more economical transportation which usually came in the form of small foreign made vehicles, especially those made in Japan such as Datsun (later Nissan), Toyota and Mazda...to name a few. I must admit that I was one of those people who turned tail on American iron at that time. However, I learned my lesson quickly after this so called crisis subsided, and soon began my fascination with off road 4x4 vehicles. My first taste of Jeeps came in the early 1980's after having owned several other domestic 4x4's. (If you're interested in more on my personal journey to Jeep-hood...click now!) Anyway...the Jeep CJ's at AMC were no exception even though they had better fuel economy than any of their American made competition. So, in 1976 AMC Jeep introduced a newly designed CJ which sported a 94 inch wheelbase which was about 10 inches longer than the CJ5, and 10 inches shorter than the CJ6. American Motors executives were going to name it a "CJ5.5", but it turned out to be more of a newly designed vehicle from the ground up than just an upgraded version of the CJ5. The Jeep CJ7 was born longer and wider than its CJ5 predecessor, which with other suspension refinements increased the new Jeeps overall safety on and off the road. The CJ7 was more comfortable to drive and had more creature comforts available as options such as air conditioning, one piece removable molded plastic hardtop, automatic transmission, solid insulated doors with roll-up windows, power front disc brakes and the Quadra-Trac full-time four-wheel-drive system. An optional 304 ci V8 engine was also available as an alternative to two sizes of straight 6 cylinder engines. In its 11 (model) year life span from 1976 through 1986 the Jeep CJ7 saw a number of mechanical and aesthetic refinements. Several "special editions" were offered including the Golden Eagle, Golden Hawk, Jamboree, Renegade, Laredo, Levis and Limited packages sporting themed paint schemes with coordinated lettering and decals, as well as dressed-up wheels, tires and interiors. Going back to the Arab oil embargo/gas crisis of 1973 (and again in 1979), AMC Jeep in trying to improve fuel economy went back to offering a 4-cylinder motor in their CJ's starting in 1980. They began using a Pontiac 2.5 liter 4-cylinder (the "Iron Duke") and later in 1983 switched to their own 2.5 liter AMC motor. AMC sold a bunch of CJ7's while they lasted even through some pretty turbulent times for automakers and consumers alike. Overall the Jeep CJ7 proved to set the trend for future "Universal" style Jeeps in blending ruggedness, utility, function, comfort, safety and style all in one neat little package. 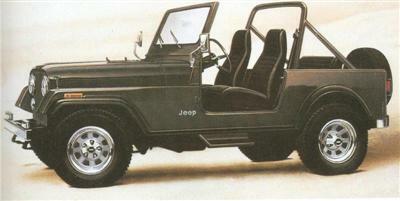 It also can be said that the CJ7 set the stage for the next generation Wrangler. On the used Jeep market CJ7's still hold their value quite well. 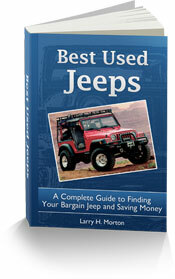 They are a huge chapter in the history of great Jeeps, and owning a piece of that history can be real sweet! 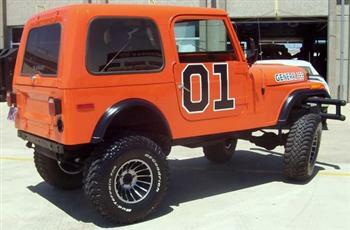 on a Used CJ7 and More! 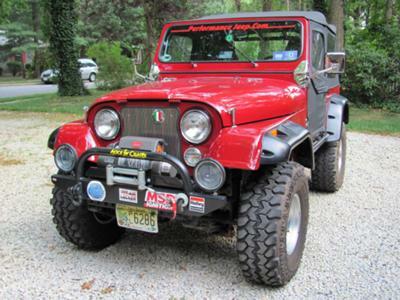 Bruno's 1985 CJ7..click photo for more detail. 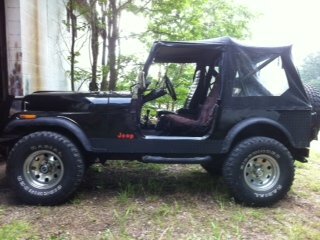 Jonathan's 1982 CJ7..click on photo for more info. 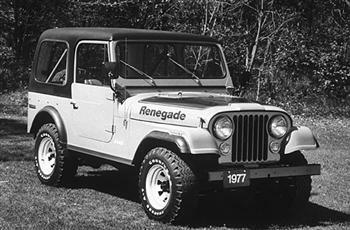 The CJ7 was offered with a hot V8 from 1976 through around 1981 called the Renegade package...click here! A Korean Jeep that looks half CJ and half ?? ?...See what that's all about!